Imagine exiting at Westminster Tube Station. 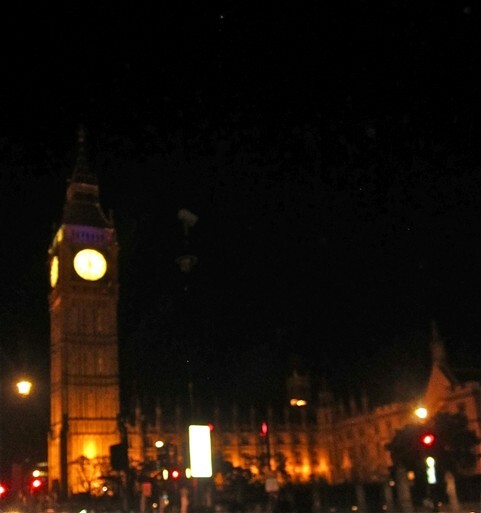 As you climb the stairs you are greeted with one of the most iconic images of London known around the world: Big Ben. Picture this same scene during the night: the massive Clock Tower (housing the famous Big Ben bell) is lit up and the clock face is shining brighter than the street lamps surrounding it combined. Now imagine it is the height of WWII. You exit the tube station at night and are greeted only by darkness. Perhaps you can make out the dim form of the Tower, but its guiding lights are completely put out. This is the scene that Londoners saw each night in the heart of London during WWII. A strictly-enforced blackout covers the entire city during 1939-1945. To prevent guiding German pilots straight into the city, the clock face was darkened at night. Unfortunately, it wasn't enough. 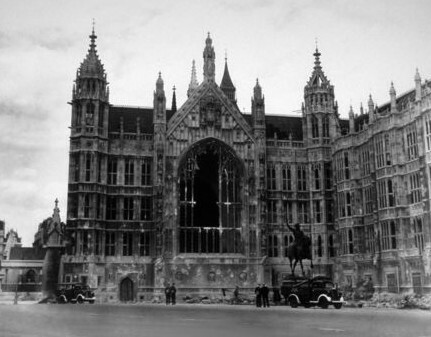 Parliament was bombed on numerous occasions over the course of the war. Some of these incidents inflicted little damage. In fact, the worst that was done to the Clock Tower during the war was smoke damage and a large crack in the clock face. 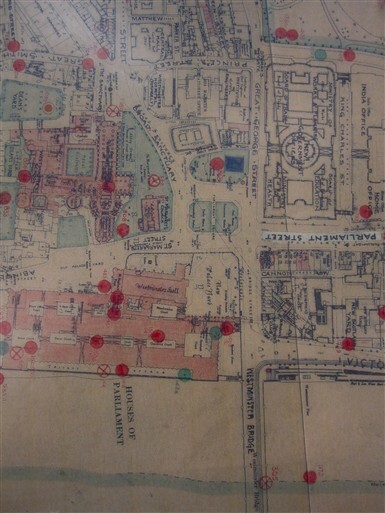 On 10-11 May 1941 one of the worst raids of the Blitz took place in the Westminster area. That night some 1,400 people were killed across London, 1,800 were injured and about 12,000 were left homeless. 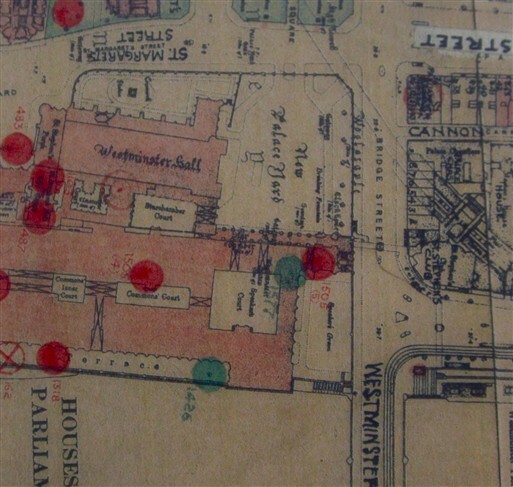 In Parliament itself fires from several bombs were responsible for much of the destruction. Chaos erupted with each bomb dropped on Parliament's buildings. The Commons Chamber was struck early in the attack and survived the initial hit, but then suffered major damage from subsequent fires. As the Fire Service (AFS) arrived, a delayed- action bomb exploded inside the Chamber, causing catastrophic damage and blowing much of the wall into the Star Court. "This chamber must be rebuilt - just as it was," wartime Prime Minister Winston Churchill was reported to have said following the attack. "Meanwhile, we shall not miss a single day's debate through this!" 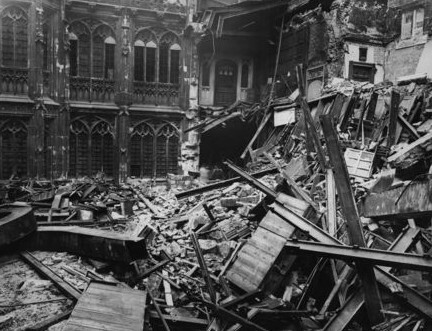 Later, in a letter to his son Randolph on 8 June 1941, he stated, "Our old House of Commons has been blown to smithereens... you never saw such a sight." 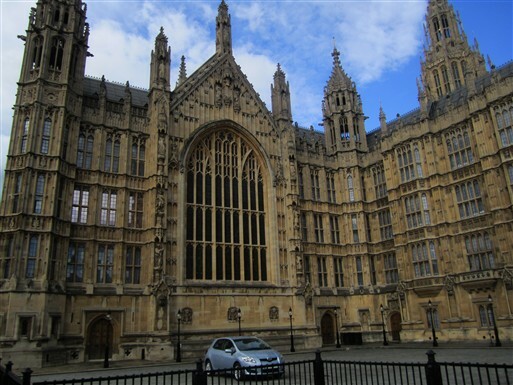 At Westminster Hall a major fire on its medieval timber beam roof raged. Westminster Hall's salvation is owed not only to the many firemen who fought the blaze but also to the elderly Captain E.L.H Elliott, Superintendant of Parliament. After being alerted that Parliament was ablaze, he rushed to the site at 3am. He urged the firemen there to focus their rescue attempts on the older, more historic Hall. Despite having to chop through a centuries-old oak door himself, Elliott and the firemen managed to prevent the Hall's destruction. Elliott did not survive the raid. As with the rest of London, the blitzed Parliament slowly returned to normal as the area was rebuilt. But unlike other destroyed areas of the capital, Parliament was reconstructed to a tee, "just as it was," as Churchill had requested. On 24 April 1945, the light on the Clock Tower was relit, accompanied by these words from the Speaker: "[it will] shine henceforth, not only as an outward and visible sign that the Parliament of a free people is assembled in free debate, but, also that it may shine as a beacon of sure hope in a sadly torn and distracted world." "A beacon of sure hope in a sadly torn and distracted world." This page was added by Emily Bisbach on 10/08/2012.